Marnee Blake brings the heat (pun intended) as well as suspense, intrigue, life or death danger, and heart-tugging romance in this second book of her new contemporary romance series centered around a group of smokejumping firefighters who risk their lives each time they're called out. I thoroughly enjoyed book one and have been looking forward to returning to Oregon for more emotion-packed stories. Crave the Heat does not disappoint! This time around, it's Dak Parrish whose heart is on the line. Dak was introduced in the first book of the series but we don't really get to know him until now so you'll be fine jumping into the series at book two. You can always go back and read book one, Tempt the Flames, later. (read my review here) Dak is a good guy and I was immediately drawn to him. He's a person who always tries to do what's right, what's honorable, but circumstances have placed him in a position where he may have to make a choice that puts his honor at odds with his heart and scuttles his relationship with Heidi before it even has a chance to become one. Heidi isn't in any rush to jump into a relationship. She's determined to prove her worth in her new position, there's trauma and feelings of betrayal in her past that she has yet to deal with, and she suspects Dak may be keeping information important to their investigation from her. Not ideal circumstances for two people who are slowly falling in love while on the trail of a serial arsonist, yet neither of them can deny the flames of desire that flicker between them nor the emotional attachment that deepens the more time they spend together. I enjoyed the chemistry between these two as well as their emotional evolution, both individually and as a couple. They so deserved a happy ending and I was pulling for them though, for a while, I had no idea how Blake was going to pull off their HEA. As for the mystery portion of the book, Blake excels at crafting a story that keeps me on my toes, eagerly anticipating what's coming around each corner. She's done that with each book she's written. I figured out the identity of the arsonist early on but it didn't detract at all from my enjoyment of the rest of the story. There are still plenty of twists throughout that had me wondering what would happen next and the climactic scenes, one in particular, left me gasping. 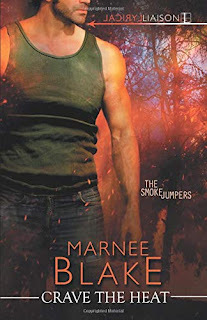 If you like contemporary romance with complex characters, hold-your-breath suspense, betrayal, life or death danger, emotional romance, and plenty of sizzle, I enthusiastically recommend Marnee Blake's Crave the Heat as well as book one in the series, Tempt the Flames. You have introduced me to another author and series. Thanks. This sounds like an interesting series. Will have to add to my TBR list. Thanks for the review PJ. Sounds like a series I would enjoy. Thank you for the review. This sounds like a suspenseful, fast paced book, and a series that I will enjoy.